Saskatchewan in winter can be beautiful but at the same time it means more shovelling. Whether you live in a condo, apartment, or small home in Saskatchewan, snow shovelling is inevitable. That moment you wake up to see your driveway is covered with snow… yeah not so exciting isn’t it? Shoveling snow from your driveway or footpaths can be an uphill task in the winter. Nevertheless, with the right approach, you can clear your driveway safely and quickly; it is the reason for this article. 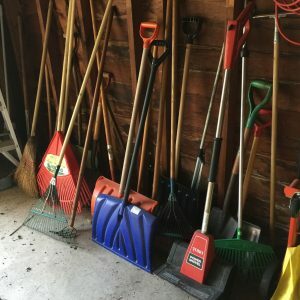 This article is going to show you how to shovel snow off your driveway with the right tool. Shovel: When shovelling snow, you need an ergonomic shovel. It is appropriate for shovelling snow because of its bend; it will reduce the risk of having back pain, also ensure the shovel has a smaller blade, to avoid lifting heavy snow. Boot: Wear the right boot to keep your feet dry and warm in the winter. Make sure it has fitting soles to keep your balance and reduce the risk of injury. Dress in layers: You don’t want to restrict your movement while shovelling snow. Dress in light layers; thermal underwear is an excellent option for keeping you warm while you shovel snow. Before shovelling snow, you need to wax the shovel blade with floor wax, candle wax, car wax or Pam spray. This wax will make your shovel blade slippery and easier to slide under the snow. 1. Don’t drive, walk or step on the snow before shovel; it makes the snow challenging to remove. 2. Keep the shovel blade close to you as you lift the snow to eliminate the risk of a backache. 3. Push the snow from the middle of the driveway to the far edges, and then raise the rest out of the driveway. You can wait for the snow to fall or shovel snow as it falls, either way, ensure you shovel as much snow as you are comfortable lifting. 4. Switch hands (right-handed and left-handed) to avoid straining your muscles in a particular area. 5. Get someone else to do it: While shovelling the driveway is essential in the winter time your state of health is more important; if you do not want to clear the pathway yourself, you can get someone to clear your driveway for a little fee. Look for a neighbourhood school kid trying to earn some extra money or speak with your property management team. If you are looking for a reliable company to manage your properties or own a home Kodiak properties is just the right company for you. Kodiak properties is the leading company in handling condo Management, Residential Management, Commercial Development. They have been serving Regina, Moose Jaw, and environs efficiently. Kodiak properties is also your go-to-guy for Apartments for rent, and Homes for rent.